Leizhan engineer worked out state-of-the-art solutions to improve the end products quality and increase the service life of paper manufacturing project. On account of various impurities exist in paper pulp, Leizhan professional engineers work together to work out better design for paper mill. The whole kraft paper pulping system comprise serveral parts: pulping, cleaning, screening, refining and thickening. By utilizing Leizhan high performance high density cleaner and low density cleaner, heavy impurities like staples, metal, stones, glasses, gravel, dust, sand, large ink particles, etc. in paper pulp can be removed efficiently. 1. Wear resistance ceramics cone increases the service life of the device. 2. Minimal space required , large productivity, easy operation. 3. Two ways of deslagging: Automatic deslagging and manual deslagging. 4. Equipped with PLC control cabinet, which makes Leizhan high density cleaner more convenient and easier to control. 1. Divided design, which makes it easier for disassembly, assembly and replace. 2. 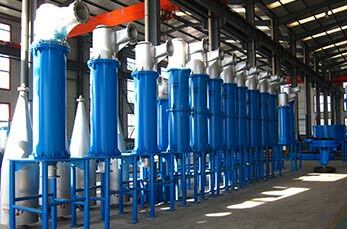 Open and close type impurity discharge. 3. Wear-resistant and durable ceramic cones. 5. Easy installation, operation and maintenance.